American Express is one of the world’s most well-known brand names, with more than 55 million loyal cardholders across the globe. And we have good news, because as of today American Express is included in our range of payment methods! This will enable you to focus on a larger international target group. American Express is of particular interest to those retailers focusing on the higher market segment: Amex users enjoy an above-average income and on average spend 60% percent more than holders of other credit cards. * And even though Amex is generally speaking relatively expensive for retailers, Mollie is offering this option at a uniquely competitive rate. So activate the credit card payment method in your Mollie account now and reap the benefits in the run-up to the festive season. American Express-users are not just known for spending freely. A panel survey carried out by American Express earlier this year shows that Amex card holders tend to regularly return to stores that they know will accept their card. Compared to other card holders, they’re even 40% more likely to do this. So American Express users are often loyal customers. What’s more, the Amex logo inspires trust in card holders. Many of the Amex users (40%) state that their general impression of a website or store is more positive when they see logos or pictograms indicating that their credit card is accepted. Here at Mollie we love clarity and simplicity. So with us you don’t have to submit separate applications for all the different credit cards: one action is all it takes. Activating the credit card payment method allows you to immediately receive payments via the world’s most popular credit cards: Visa, MasterCard, and now American Express as well. 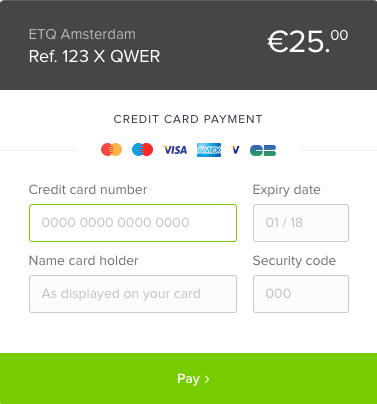 In addition to these familiar names, we also process payments from co-branded cards such as Dankort, CartaSi, Nordea and Carte Bancaire, and we support Maestro, V-Pay and Visa Electron. The way in which we offer American Express is unique. A contract with Mollie is all you need to receive payments via this method. You don’t have to sign a contract with American Express and you don’t have to pay any connection charges either. There is no long waiting period because we process the application procedure internally. In most cases you can start receiving payments within one working day. After activating the credit card payment method in your Mollie account you can immediately start receiving payments via American Express. Not yet receiving payments via credit card? Activate this payment method in your account now and boost your turnover in the run-up to the festive season!